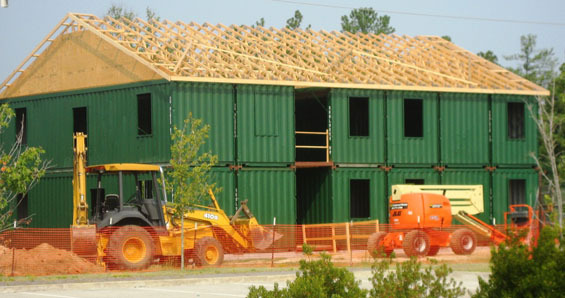 An idea whose time seems to have arrived is the use of stockpiled shipping containers as modular units for building homes. Because of the balance of trade in the United States, these hefty steel boxes are piling up in ports around the country and posing a storage problem. Several architects and builders are taking advantage of this surplus to recycle the containers. According to David Cross of www.sgblocks.com, "a container has 8000 lbs of steel which takes 8000 kwh of energy to melt down and make new beams etc... Our process of modifying that entire 8000 lbs of steel into a "higher and better use" only takes 400 kwh of electrical energy (or 5%). Granted it takes a bit more "muscle" but we call this Value-Cycling which we feel is that next step up from Re-cycling." Each container measures 8 feet wide by 40 feet long by 9 feet tall. SG Blocks sells the finished structural systems (also called SG Blocks) for $9,000 to $11,000 per unit. 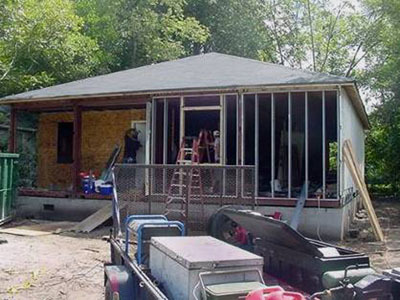 The finished units have one or two walls removed and include the necessary support columns and beam enhancements. 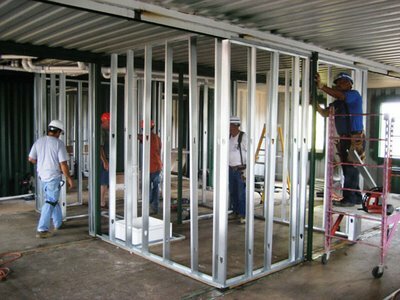 According to KPFF Consulting, a structural engineering firm in St. Louis with extensive experience working with shipping containers, the units are stronger than conventional house framing because of their resistance to "lateral loads" -- those seen in hurricanes and earthquakes -- and because steel is basically welded to steel. The roof is strong enough to support the extra weight of a green roof — which has vegetation growing on it — if the owner should want it. As for their energy efficiency, they claim that when the appropriate coatings are installed, the envelope reflects about 95 percent of outside radiation, resists the loss of interior heat, provides an excellent air infiltration barrier and does not allow water to migrate in. One idea that has occurred to me is that this system might benefit from the use of SIP's (Structural Insulated Panels) for the roofs, rather that standard truss framing. 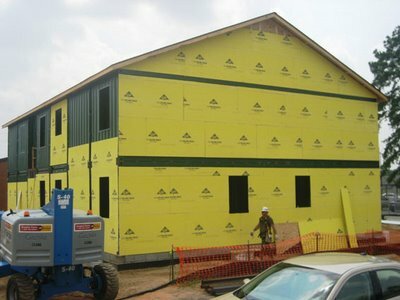 SIP's are very well insulated, install quickly, and use much less wood than convention roofs. Shipping containers are self-supporting with beams and stout, marine-grade plywood flooring already in place, thereby eliminating time and labor during the home-building process. Cross said construction costs are comparable to those in conventional building. 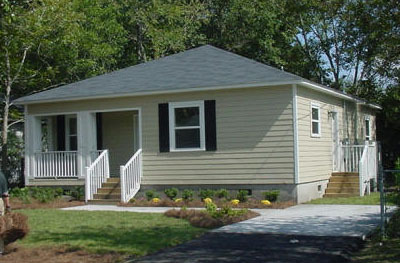 Four to seven units are used in a typical home, he said. Instead of nailing the siding they use "Super Therm", a ceramic paint made by Superior Products of Minnesota; it can be used as a paint, an adhesive, an insulator, a fireproofing material and an acoustic barrier. With this ceramic paint, they claim the insulation capacity is equal to a conventional house. 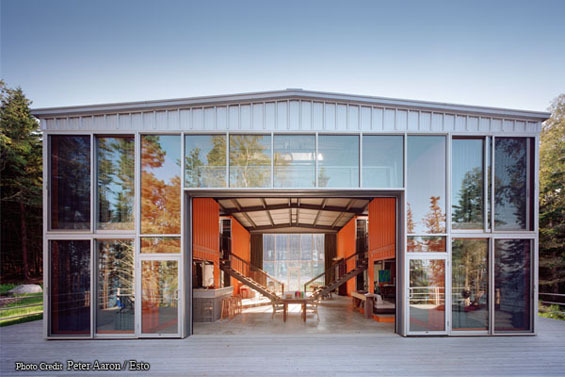 This finished house is virtually indistinguishable from conventional housing. Adam Kalkin, of www.architectureandhygiene.com , has also become enamored with shipping containers as an architectural solution. 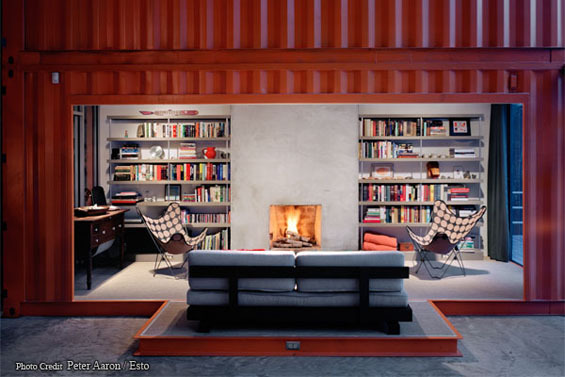 The idea to do something with shipping containers came to Kalkin, a New Jersey resident, when driving to New York City, where he saw sky-high stacks of the unused cargo containers in the shipyards he passed. Twenty-one thousand containers hit American shores every day of the year. 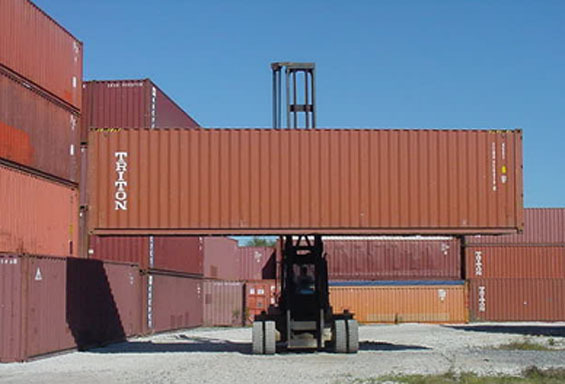 Containers can be shipped to the interior of the country via trains and trucks. 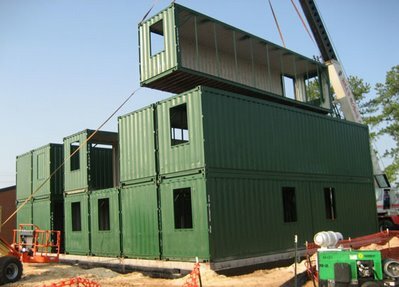 Shipping containers are like Lego toys and the modules can be assembled in thousands of ways. In general it is a good thing to recycle materials that otherwise have no further use for their intended purpose, and this is true here. As for whether one can make a comfortable house out of these metal boxes, the biggest question is: insulation...it is essential, but there are many ways to insulate these containers, so this is not a big concern. Another concern that many people would have is whether a metal box would have adverse health effects because of EMF (electro-magnetic frequencies) generation or propagation. Some people are sensitive to these while others are not. There is no doubt that these containers can be used to fabricate very strong shells that would withstand substantial abuse from the ravages of nature. I’ve been using containers for years as storage units, but in our climate they are only slightly better than leaving stuff outdoors because the sweet so badly inside. The containers featured in this post all look in much better shape than we ever see here in Alaska. SIPS are not much good in our climate either. In fact most municipalities no longer allow them for use on roofs because they rot out so quickly. I saw a roof replaced this past summer that was only 5 years old! I think I’m going to very much enjoy cruising through your full site. I'm just getting my head around this whole blogging concept, and I think I like it a lot. We are in the process of developing a company that combines solar with panelization. It is a simple solution to the cost issues of "green" building. Lot of other stuff good about it, but I don't want to toot my horn on your site. The problem is, there is so much information out there which is great, but impractical unless you are completely loaded with money or don't have a day job and are willing to devote the entirety of your existence to making your life greener. I have a buddy who has a company which specializes in green reconstruction, and all he does is redo homes of the very rich with a conscience. Not saying that's a bad idea, but it isn't going to change the global warming crisis either. The whole mindset of this country and others needs to change. It is beginning. "An Inconvenient Truth" was a start. But the solutions need to be simple and cheap to gain traction. Looking through your blog, I see innovation, and that's outstanding, but how do we get Joe Blow to go green? That's the real hurdle, isn't it? lies and deciet in "an inconvenient truth" notwithstanding, getting joe blow to go green is a phenomenal idea..... the low cost aspect is a bonus of course, as far as sweating, these things arent gonna be sealed up like they were as shipping containers. 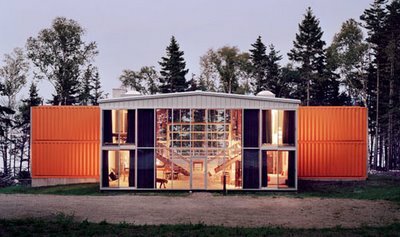 Three observations on shipping containers. According to the tags on the doors, the timber component (the floor) almost invariably is treated with serious pesticide. There are multiple purposes to the pesticide treatments - a) to prevent transplantation of harmful insects around the world, b) to protect the structure of the floor, and c) to protect the contents from infestation and damage. The treatments are serious both in quantity, being roughly in the range of 1 to 10 pounds of pesticide in the wood, and serious in quality. Even 5 lbs is enough to kill a staggering number of insects. As often as not, these pesticides have been banned in the US (and frequently Europe too). Some cause cancer (e.g.., DDT) while others cause testicular atrophy (e.g., Phoxim). Some take hours of diligent searching to track down on the internet either because of trade names or cryptic abbreviations. Pesticides are at least somewhat volatile and almost certainly will permeate the contents over time, especially if the can gets hot. Note that the contents can include occupants; caution with food storage in containers also advised, unless strong measures are taken (e.g., remove and replace the floor with untreated wood). Please note that lacquers, varnishes, paints and plastic sheets are highly permeable to organic vapors. I made container house. I use new office container. 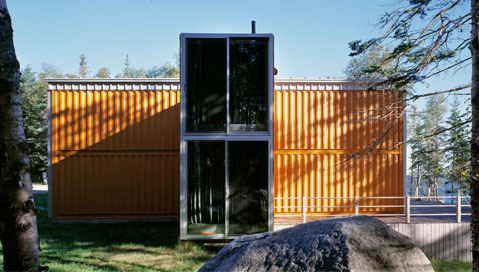 I have a team, and i want to try to build a house whith shiping container. Very interesting and exhaustive article on container building. I work at Habitainer -www.habitainer.com- developing container basis projects by demand. The characteristics of container construction regarding earthquake and heavy weather conditions are remarkable, -always depending on correct design- maintaining a "cluster" structure capability that is way higher than any conventional building. But one of the characteristics I enjoy more on container is their amazing capability of moving around as your life does. Fitting all your stuff in these moving houses is something really useful. Of course you need to be sharp on the design as it will require more specifications to maintain the standard capability of intermodal transportation, but once this requirement established it is not to hard to accomplish such. This aspect, along with how you use these dwells regarding balance with environment in everyday activities are major exponents on container building for the future. Hello....how do I find an architecht who will design and oversee the building of my shipping container home in PA? I suggest that you go to the websites of the designer/fabricators listed in the article and contact them regarding this. This is timely, I've been thinking of building a new shop. To use this vs a conventional steel building would be great, do you have any suggestions or standard details available for the attachment of the roof beams to units and closing gaps between containers to the weather? I'm guessing it involves a lot of welding. There are many ways to approach roofing a container home. As pictured in the article, it is common to use standard truss roof systems to create a monolithic roof over the entire project. Also pictured in the article is a way to weld the container together to assure that they don't separate over time. Thanks for a very useful article. I am intending using shipping containers in my new warehouse in the UK (near Liverpool) not only as storage units but also to create the mezzanine floorways that will allow access to the higher floors (I will be going 3 high). I will be reusing some old heavy duty racking spars as extra support posts. A tight budget pushed me in this direction but my recent research is making this part of the project quite exciting. 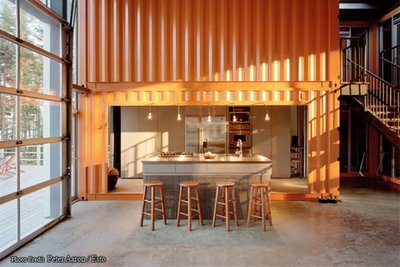 Think I could end up with something looking pretty cool and modern rather than a stack of old shipping containers looking dull brown and rusty!! Obviously there are some serious issues about the quality of the building (especially if for homes), especially where overhanging balconies etc are used. There seems to be a bit of an assumption that you cannot go wrong but I am sure that there are certain areas of the some designs that could cause difficulty. Some sort of inspection regime seems necessary for domestic units that our out in the weather. The excellent point about pesticide levels in the floor and previous contaminents from whatever the units carried also needs to be properly addressed. When the containers are only accessed occassionally I would expect a good preclean and seal would keep levels right down but if I lived in such a unit I would need to know levels were nominal. Obviously addressing this issue probably won't be done by those who profit from selling the homes unless they are really pressed!! Thanks again..it is the best article I have found so far. Good blog post...Containers are in many ways an ideal building material because they are strong, durable, stackable, cuttable, movable, modular, plentiful and relatively cheap.